The uniquely qualified staff of Horizons Real Estate Marketing and Sales has a myriad of experience in successful, specialized real estate marketing and sales in both resort and urban markets. We use our proven methods of improving and accelerating the sales of multi-residential developments to your benefit. We also accelerate sales through improved marketing methods and material production with a planned and proven strategy. Our specially trained sales staff provides potential buyers with detailed and specific knowledge of your products--the only products they represent. Why should a sales team that represents you spend even one minute selling someone else's product? Depending on the project, we are often able to increase prices by increasing demand. 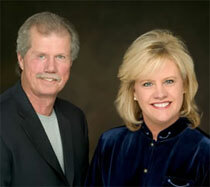 Mitzi has assisted developers with projects in Colorado, California and Washington State. She managed and assisted with numerous projects for Maverick Real Estate based in Vancouver, BC, Canada. Mitzi also managed sales programs with IMI Resort in Breckenridge and SolVista, Inc. in Grand County, Colorado. Mitzi's experience not only encompasses real estate developments, but also retail management, interior design, resort operations management, guest services and special events planning and coordination. Mitzi has also been an active community supporter. She has been involved with Rotary International and was active as a Board Member in the organization of the Fiesta Bowl. Bill has over thirty years of experience in resort development and resort operations in Colorado and New England . As CEO and COO for numerous resorts his experience has included development of feasibility studies, master plans, business and operational plans. He was a key player in the planning, development, construction, expansion and management of ski areas, golf courses, resort villages and communities, including management of special districts. Within those resorts Bill has also managed and overseen the marketing for every aspect of resort operations and sales. Bill has still found time to give to communities by serving on the boards of museums, governmental agencies, fire departments, ski industry associations, chambers of commerce and resort associations. It never hurts to explore ways to improve, regardless of present success. Due to the diverse scope of our experience in a wide variety of projects and geographical locations, we have been exposed to strategies, programs and techniques that may not have been used in your competitive area or type of project. Nothing ventured--nothing gained!